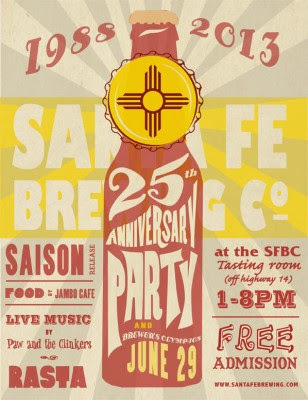 Santa Fe Brewing Company, New Mexico's first microbrewery, celebrates it's 25th year of business this Saturday at the brewery. Beginning at 1 pm, the party will feature food, live musical acts, and Brewers Olympics. This being New Mexico, you can't have a brewery party with music unless one of the acts is a bluegrass band. Santa Fe's got this covered with Paw and the Clinkers. I'd prefer something along the lines of Amon Amarth, but it's not my party. The Brewers Olympics will pit Santa Fe vs. Second Street and Marble in fierce battles including a dolly race, yeast balloon toss, brewers trivia, six pack builder, and keg toss. No odds out of Vegas as of yet. You will also get to be part of the release of Santa Fe's Saison, available in cans, no less! Santa Fe also released bottles of Kriek recently, available in Albuquerque stores but you may as well grab a bottle while at the party, if only to defend yourself against person uncontrollably flailing away to the bluegrass music.